A Christian controversialist who wrote against Judaism in the second century (135-170). He is the author of a "Dialogue Between Jason and Papiscus." The former is supposed to be a Jewish Christian, the latter an Alexandrian Jew. So overcome is the latter by his antagonist's arguments, that in the end he becomes a convert to Christianity. This dialogue was a favorite in the third century; "was known to almost everybody in the year 500" (Harnack, "Texte und Untersuchungen," i. 3 et seq. ); and still existed in the seventh century, but it has now completely disappeared. Although this dialogue is preserved in great part in the similar Latin composition, "Altercatio Simonis Judæi et Theophili Christiani," it is impossible for any one to form a correct idea of its contents. 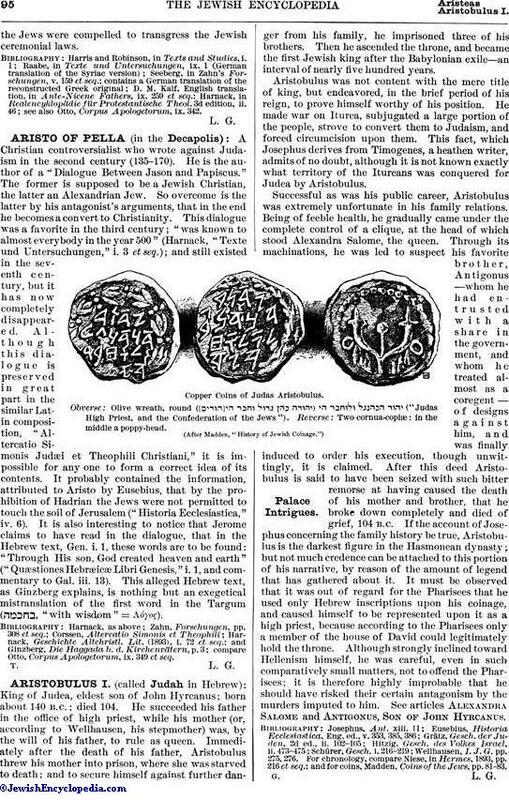 It probably contained the information, attributed to Aristo by Eusebius, that by the prohibition of Hadrian the Jews were not permitted to touch the soil of Jerusalem ("Historia Ecclesiastica," iv. 6). It is also interesting to notice that Jerome claims to have read in the dialogue, that in the Hebrew text, Gen. i. 1, these words are to be found: "Through His son, God created heaven and earth" ("Quæstiones Hebræicæ Libri Genesis," i. 1, and commentary to Gal. iii. 13). This alleged Hebrew text, as Ginzberg explains, is nothing but an exegetical mistranslation of the first word in the Targum ( "with wisdom" = Λόγος). compare Otto, Corpus Apologetorum, ix. 349 et seq.